Toronto Raptors president Masai Ujiri speaks about acquiring player Kawhi Leonard in Toronto on July 20, 2018. 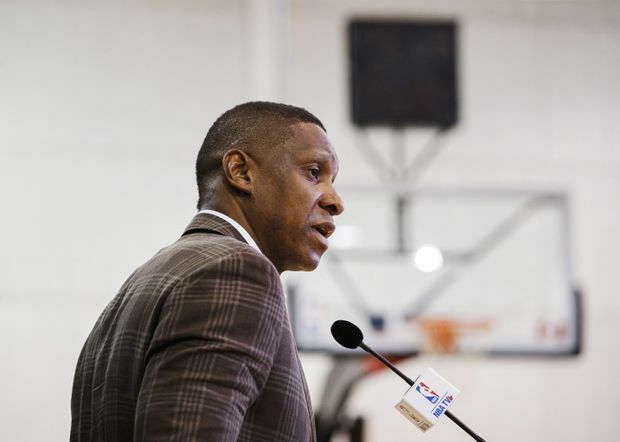 Toronto Raptors president Masai Ujiri began his first news conference since the most divisive trade in team history with apologies. It was a kind thing to do, as well as the wrong one. In the two days since moving DeMar DeRozan, a stab-in-the-back narrative had taken hold. Ujiri was painted as the man holding the knife. DeRozan vented on social media – “Ain’t no loyalty in this game.” Anonymous sources – so, DeRozan’s proxies – said the player had been assured he was not on the block. It was noted that in the release announcing the deal no special mention was made of DeRozan’s contributions to the franchise and city, and that other NBA players had noted that in turn. That sense increased when you got a look at Ujiri on Friday afternoon. All of a sudden, the suavest man in Canadian sports seemed deeply ill-at-ease – stumbling over his words, eyes downcast, sweating in an air-conditioned room. He took a couple of runs at apologizing a couple of different ways. First of all, he regretted “a gap of communication” with DeRozan. According to Ujiri, no promises were made, but he’d talked about the future with DeRozan during a brief encounter at the Summer League in Las Vegas. Perhaps that confused matters. “Maybe I should have handled it better,” Ujiri said later. He said the word “sorry” a lot. But when someone tried to fold the firing of coach Dwane Casey into the account and turn this into a proper struggle session, Ujiri lost his patience. Tired of backing up, Ujiri began moving forward with purpose. When someone asked about the leg injury that put Leonard out of action last season and the related “risk,” Ujiri snapped again. You could see Ujiri making an effort not to lose his cool. Unless they are a LeBron James-level human brand, players don’t get a say. If they did, the league would be unsustainable because everyone who matters in it would only agree to play for the Lakers or the Knicks. This ecosystem – which is enormously profitable for everyone involved – works because there is only limited hindrance to movement. Anyone who doesn’t like it is free to opt out entirely and play in Turkey. You’ll notice no one ever does that. So it is a bit rich to throw around words like “loyalty” in this context. Before free agency, there was more loyalty in sports. Most players also made as much as a successful plumber. They gave up one thing to get another. It is richer still to expect Ujiri – the one guy on the Raptors payroll who has exceeded his performance targets in the past little while – to apologize for the way things are. DeRozan should understand that. He is a lovely guy who was comfortable in his work and, demonstrably, not good enough at it. No one’s saying he can’t do it any more. He won’t lose a nickel of earnings. He gets to go somewhere else, continue doing the thing he enjoys and get monstrously wealthy doing it. I’m sure that sounds like a pretty good deal to anyone who’s ever been fired, or laid off, or made redundant. DeRozan wasn’t fired – although that seems to be how some people are taking it. He was redistributed. It’s silly to complain about the unfairness of that process, as if to suggest that the goal here is to make it more equitable. By its nature, professional sport is deeply unfair. That’s why people watch it. Today, the Raptors are better. The fan base is more engaged. Canadians who didn’t care about basketball last week suddenly do. This may be the most successful July in NBA history. Instead of applauding, people are grumbling that Masai Ujiri is mean and changed things too much (after complaining in May that he didn’t change things enough and didn’t know how to be mean). We don’t yet know how this will all turn out – if Leonard will be fully fit; if he’s the difference-maker everyone hopes; if the Raptors will finally win big; or if he re-signs after the end of the season. Regardless, it was worth the gamble. Ujiri’s absolutely right – something had to change. The only thing we do know for sure is that, in this town, no good deed goes unpunished.